In the district of Wayanad in Kerala women often work in labour intensive farming jobs where they are usually paid less than men for the same work. TGG Foundation is a small rural development charity who provide fair employment opportunities to women like Beena. With International Women’s Day upon us, we wanted to share the story of just one of the many inspirational women we've met recently. 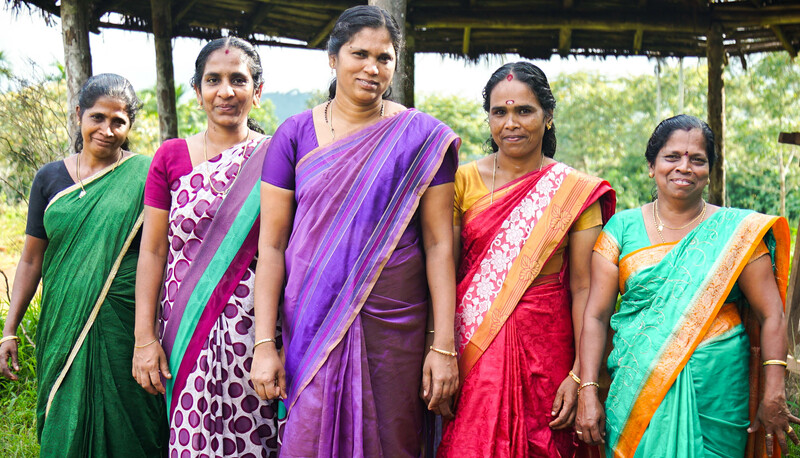 TGG Foundation, a small community charity in Kerala, India, works to improve the lives of the local agricultural community (particularly women) through creating livelihood opportunities and skills development. They intend to soon build a Rural Development Hub, which will create a permanent home for TGG and its activities, as well as provide a space for growth. Beena Louis, or “Beena Teacher” as she is know at TGG Foundation, is a core member of the operational team. Her days are generally spent in the tailoring unit of the at TGG Headquarters known as the “Women Empowerment Centre”. Beena is a skilled seamstress, and an excellent one at that. She grew up in Wayanad and learnt how to stitch from a very young age. Before joining TGG Foundation she was working in a nearby village as an assistant in an optical shop. The gender inequalities that exist in many parts of rural India have not gone unnoticed by Beena. Locally most of the job opportunities are in agriculture. Just like most of the women in the area, she recognises that if you are a woman and work on a farm, you stand little chance of earning as much as a man. In Wayanad women working in farming jobs earn on average 48% less than men. In June 2015, through a friend of hers who had just started working with TGG, Beena applied for a job in the newly established tailoring unit. The purpose of the unit has always been to provide a space for local women to make a livable income doing something they enjoy. In Beena’s case the opportunity not only gave her the tools and facility to thrive but it also gave her a development path. Nowadays, Beena is at the helm in the stitching unit. Her work addresses both local demand (mostly saris, shirts and school uniforms) and international demand. Alongside stitching she is also teaching local girls the craft, and Beena is heading up the newly created TGG Foundation Self Help Group. The Self Help Group will galvanise local women in the area so that they can pool their resources and develop a micro-financing system. This form of credit will allow members of the group to make purchases which before would have incurred hefty interest rates, resulting in more debt. The group also receives certain tax benefits and rebates from the government. Beena is positive about the future. She believes that things in the local community are changing for the better and in relation to women in the workforce she feels that there is light at the end of the tunnel. Ultimately she wants to help provide for her family and send her two children to a good college. Whilst the extra income that is provided through her working relationship with TGG Foundation will help with that goal, it is the fact that she is working for an organisation that is making a difference to the community which gives her a real sense of pride. The Self Help Group has now reached 10 core members, which means they can now apply for basic healthcare and a type of pension. As the group continues to grow so to will the micro-credit system at the heart of it, allowing for more revenue generating activities to be established. With the extra members on board, Beena has now stepped into a managerial role and has began organising the team and delegating responsibilities. It is the hope that once the Rural Development Hub is created, more women in the area can become a part of the Self Help Group which in turn will create more opportunities for development and leaders like Beena. She is now at the helm in what is a fairly new project in an area of the world where often men and women are not viewed as equal. And for that, we salute her.